Built architecture and design, components and systems, products and regulations: what makes Modulo unique is the critical reading always with an eye to innovation and technology of the great transversal topics to architecture: the complex wrapping, sustainability, energy efficiency, the integration to plants, renewable resources... Off common places and the obvious, “in” the planning, Technology filter is applied to all aspects of the planning, production, technical culture, current regulation, components, systems, products: with great attention to popular aspects and of immediate understanding: synthesis, layout, deepening moments. 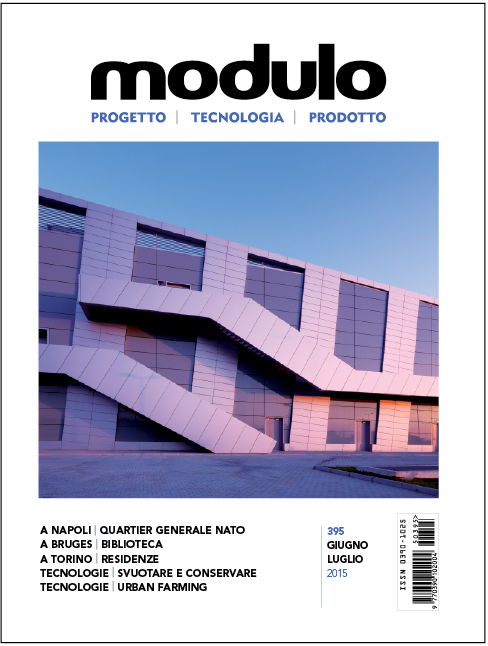 Over the years Modulo has interviewed all the big personalities from the star system: from Libeskind, to Fuksas, from Alsop to Nouvel... conversations and reviews about works which give an idea of the great architecture and the technologic effort, even this is a own and unique interpretation of Modulo. Great attention is dedicated to “daily architecture”, and knowledge of innovative tools of components and systems, which allow reaching high planning and productive quality. Trim format 230 x 300 mm. Half page upright bleed 115 x 300 mm. Half page across bleed 230 x150 mm. The advertising material requested: pdf file in four-colour and high-resolution (minimum 300 dpi). The ad piece must be provided 20/30 days before the release date. The Editor reserves the right not to publish material non-complying the editorial guideline.